Well it's September 28 and lookit what came in from the garden today. tomato soup (both roasted and non). and yes, even tried drying them on the dashboard of my car. And now? I am roasting. It's smelling good and garlicky around here. When I'm done, these roasted tomatoes -- those that escape immediate ingestion, that is -- will go into the freezer to serve over pasta in the dead of winter when I have forgotten what it is to be drowning in a glut of tomatoes. 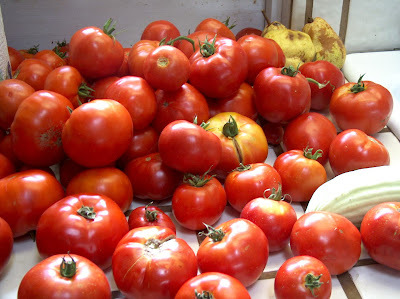 If you, too, would like to know about the glories of roasting tomatoes, check out this post from Notes from a Cottage Garden. The roasted tomatoes really do taste heavenly. Please excuse me now. I have more roasting to do. Lots and lots more roasting. Are you tomatoed out yet???? They look lovely! And won't you just love them in the winter. I just bought tomatoes for $2 a pound today and I'm feeling a little envious of your bounty. 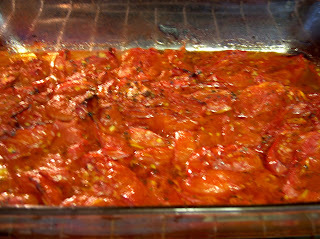 Thanks for the linking my blog post....so glad you are enjoying the roasted tomatoes! Thanks to you, Connie, for educating me about roasting tomatoes. It's fun to find another way to prepare and preserve them. Wow!! That's a lot of tomatoes! They look yummy though! Roasting them in the car. Hmm. There's an idea I hadn't thought of. LOL! Our 'maties are all gone now unfortunately. Still hauling in okra by the barrel full though! (well maybe not quite by the barrel...but you get the idea!) :) Love all them 'maties while ya gottem. OM Gosh! We are once again channeling each other. 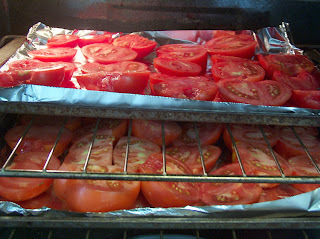 I did a post yesterday on roasted tomatoes. I wish I had as many as you but we are in the south and our tomato plant are just starting to bud. Wow, I'm jealous! What a great harvest you had! I love all your ideas on what to do with them. oh i love tomatoes, i love all the things you've been doing with them! Roasted tomatoes sound wonderful right now. I could eat tomato/es or tomato/e products every single day of my life and be happy. 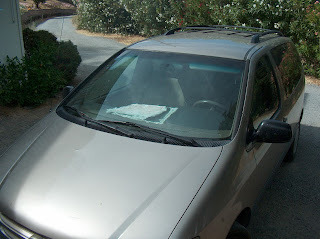 Not so sure about the dashboard drying, though. In my car, they'd probably pick up a pathogen. Tomatoes are costing a fortune here. Your tomatoes are such an abundance in glory. LOVE roasted tomatoes! I can just smell their wonderful fragrance with the garlic!! Popped in to say hi! I'm so glad I saw this. 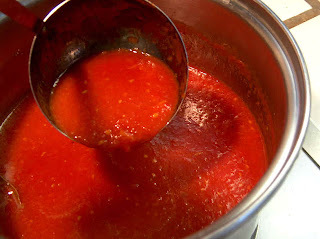 I've wanted to try making my own tomato sauce, and I think this would make it taste marvelous! I tried this at the beginning of the summer. I didn't put enough olive oil. I have so many tomatoes so now I know what I am going to do!!!!!!!! We ended on putting it on pasta. Wonderful flavor. I had my girls pick a ton of tomatoes today, so tomorrow will be busy. Sooooo jealous of your garden! I bet it smells just fabulous at your castle!!! 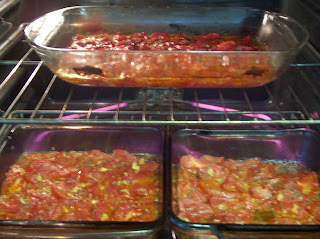 I just roasted some tomatoes with garlic and onions to make a marinara sauce. Talk about GOOD! Good luck with all the roasting! Vanilla bean paste is extract and vanilla bean in one! It's a little more expensive than extract but cheaper than beans. It comes in a jar and the jar has a little "chart" of substitutions on it. Very easy and oh so yummy! I would suggest buying the Nielsen-Massey one. It's known brand. Hope this helps! blogs like yours always inspire me to want to cook...I stink at it...but I do admire your talents with ingredients!!! This looks absolutely fabulous! I can smell your tomatoes roasting in the oven from here-Delicious! Tootsie, your garden is amazing. I wish I had that talent. you may be tomatoed out, but with homemade pasta sauce in Dec/Jan, you'll be the envy of the entire block! i too, just bought tomatoes for the first time in months. (we get to benefit from my in laws garden) $2 a pound as well. and they were shameful looking. I have never tried Roasted Tomatoes. It looks like they smell good, lol! :) I am sure it feels good to store that up. By the way, your pumpkin contest seed idea is fabulous! That is an exciting tradition to start. I'd love to hear how it turns out. 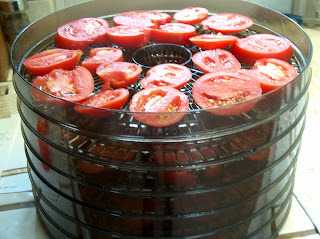 I would like to have a dehydrator.